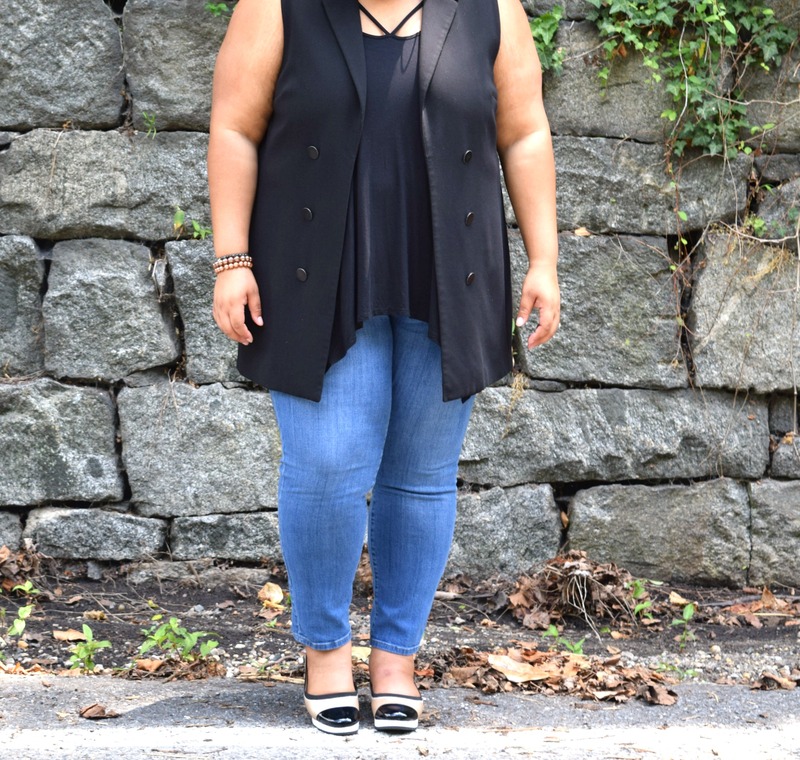 One of my favorite items in my closet is this black sleeveless vest. Whenever I wear it I feel chic, on trend and well put together. Like my collection of kimonos, a having at least one sleeveless black vest in your wardrobe is a must. This kind of vest is a timeless garment that can be dressed up or down. It can also be styled year-round. 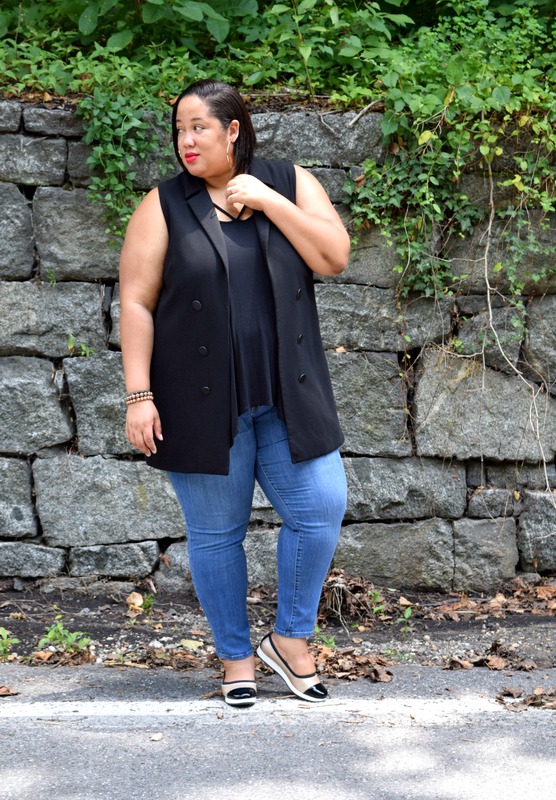 On this particular day, I styled the vest with one of my go-to summer tops, as well as my favorite pair of jeans. Becuase I was headed out for a day date with hubs, I decided to wear a red lip. A nice pop of color on the lips is the easiest way to kick a basic outfit up a few notches. Adding an armful of bangles or beaded bracelets is also another way to amp up a basic outfit. 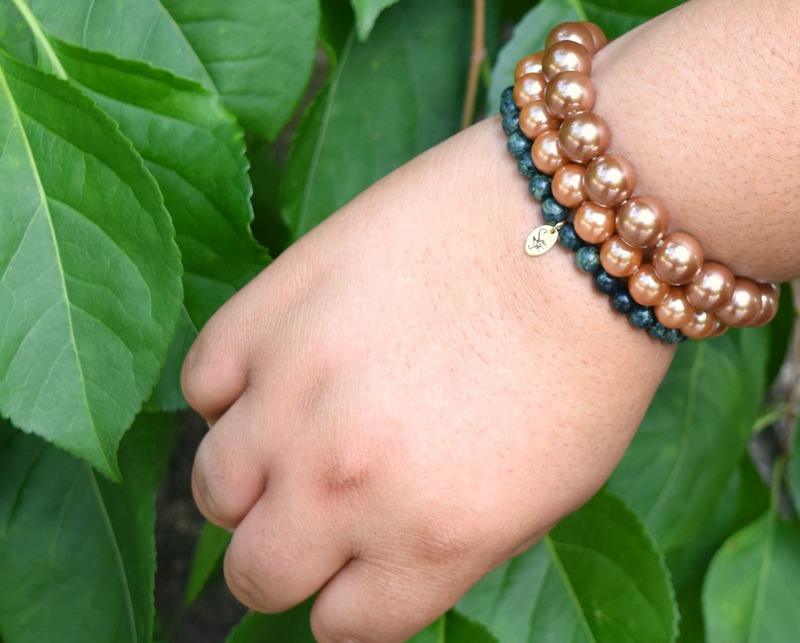 So, I pulled out my beautiful Kambaba Jasper bracelet, c/o Joseph Nogucci, and layered it with a pair of bronze beaded bracelets I’ve had for years. Hubs was happy that I finally decided to style my latest pair of platform flats. He picked them out for me a while back and I’m so glad he did. I LOVE them! I’m telling you, platform flats and oxfords have become “my thing” this season. As I mentioned previously, I don’t wear heels that often. However, I like to have a little height every now and then. Opting for a pair of shoes with a slight platform is a nice compromise. 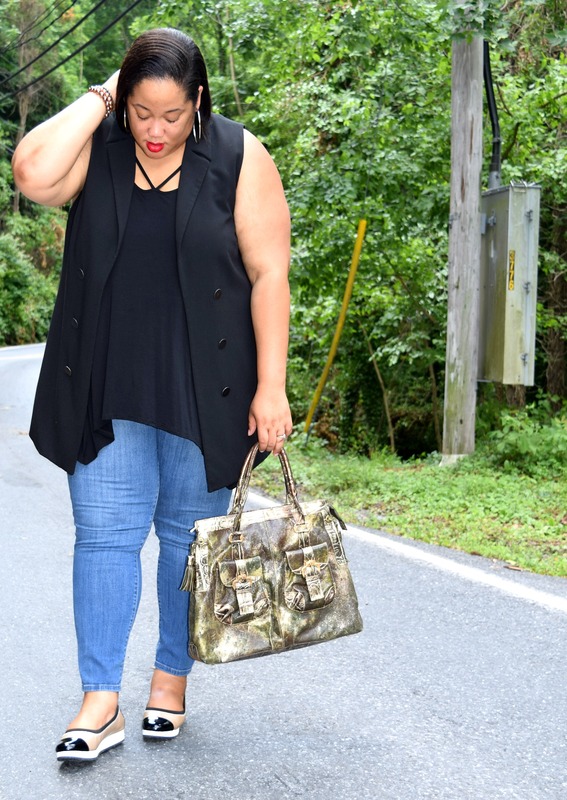 So tell me, do you like how I styled my sleeveless vest? Do you have one in your closet? Let me know! Thanks for reading and be sure to share your thoughts with me below. Until next time, be blessed and stay safe…XO! The vest is the perfect layering piece! It definitely is! Thanks fo stopping by! This vest is so classy and chic! And I love how you styled it with the two-tone shoes! Thanks so much! I love these shoes! I’m really feeling your black sleeveless vest and your shoes here. I actually don’t own a sleeveless vest in black, but I do own one in off white and one in navy blue. I love your vest! super cute outfit! Sleeveless vests, FTW. I usually reserve wearing them in the cooler seasons. It’s way too hot for me to layer with a sleeveless vest. However, just like you did here, I can go with a sleeveless clothing item underneath. Thanks for the tip. No prob! Thanks for reading & commenting. Looking super cute. I agree with you regarding the importance of a black vest. It pairs well with so many things. Love the one you’re wearing. Thanks so much! It’s a great investment, for sure! You look great! I love that vest too, it’s such a classic! Love those shoes as well! Looks so chic! You’re making me want to pull mine out of the closet tomorrow! Thanks, LaToya! I love this vest. Such a great purchase!